A potential client recently asked us whether Yoast SEO plugin handles Japanese text. The WordPress Yoast Plugin has over 3 million active installs and is widely regarded by developers as the Gold Standard in WordPress SEO plugin support. While there does appear to be an issue with getting an accurate word count through the plugin, this isn’t really a major issue as we will explain in this article. This topic is also a good place to look into a related issue of Japanese text readability for SEO and general web strategy. What’s the Issue with Japanese text? is recognized as 9 words. is recognized as a single long word! The Yoast plugin gives a real time count of how many words are in any given blog post or page. The reasons are probably connected to SEO folklore about optimum “keyword density” percentages. If keyword density is a new term for you it works like this. Imagine you have a blog post about “blue widgets” that is 500 words long and your keyword phrase “blue widgets” appears in the article 5 times. In this example your keyword density would be 1%. Generally you want to have your keyword phrases appearing more than once but search engines like Google worked out a long time ago that “more” doesn’t equal “better”. If your blog article uses a keyword phrase repetitiously then there is a good chance that you are writing to game the system (a.k.a. “keyword stuffing”) rather than writing for human readers. If so, your article will receive an SEO penalty. To put it another way, there is a law of diminishing returns on keyword density. After you mention your target phrase a few times you don’t really get much additional benefit from using it over again. At a certain point you actually get diminishing returns as negative penalties start to apply. Google’s own Search Guru Matt Cutts explains the issue well. There is some evidence that Google is now favoring longer, “content rich” articles than they might have been in the past as part of their ranking formula. Having a word count tool might be useful from that perspective but once again, to the extent that word count is a actually a factor in search algorithms, the impact is likely small. The evidence suggests a lot of variability across different types of articles and it might simply be a case that longer articles attract more organic inbound links from interested bloggers. Should I Use Yoast Anyway? The Yoast SEO plugin for WordPress can be configured to do a whole lot of things besides being just a glorified word count tool. Google search result snippet preview, so you can see exactly how your content will look when someone searches for it on Google. Google Authorship verification for your website. Google Authorship is a way to link content you create with a Google+ profile – easily promoting your blog or latest news about your company and/or products and services you’re an expert at. Synchronization with Google Webmaster tools. Automatically generate an XML sitemap file where you can list the web pages of your site to tell Google and other search engines about the organization of your site content and what pages to view for specific information. Advanced indexing configuration such as removing a specific post, page, post type, or a taxonomy from the sitemap and thus avoid “duplicate content” penalties. Social integration that lets you show you the correct title, description, and image for Facebook using the OpenGraph meta data. Allows adding Twitter cards in WordPress. Improved canonical URL support, adding canonical to taxonomy archives, single posts and pages and the front page. In addition to all the “technical” SEO tweaking the Yoast plugin does a great job of encouraging text readability i.e. content that is easy for visitors to read and comprehend. But hang on a minute. “What has that got to do with SEO,” you might be asking. Is “readability” one of the factors of the Google ranking algorithm? We know that between 2010 and 2015 Google actually had “readability” as a little know filter feature of their search interface. 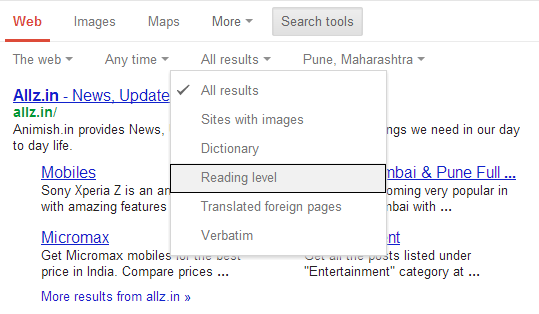 It used to be possible to filter search results by basic, intermediate and advanced reading levels. So it seems at least possible that Google is giving some small boost to content that meets the lower secondary education level readability guideline. Unfortunately there isn’t much empirical evidence to test the proposition. In fact web accessibility consultant Karl Groves has stated “Better SEO is not an accessibility business case and this myth needs to go away”. So if the direct SEO benefit of having highly “readable” content is arguable, what about the indirect benefit? This is more tangible. We know Google wants to serve up search result content that users will actually READ, not just skim for a few seconds then bounce away. From this we can infer that the extent of user engagement with your content (“dwell time”) is at least to some extent a ranking factor in their organic search formula. Furthermore, if visitors find content easy to read, they will likely share it online as well. This leads to more inbound links, more visitors, more sharing – a virtuous circle. Last but not least, never lose sight of the fact that search engine results are just a means to end – getting visitors to take some kind of conversion action on your site. That conversion action might be buying something, becoming a member, requesting a quote or signing up for a newsletter. You are not likely to achieve any of those goals if your text is mostly turgid and dense reading. Various researchers have attempted to apply similar techniques to Japanese writing in order to come up with a similar objective way of measuring the readability of Japanese texts. In order to solve the issue of undefined word boundaries within sentences, Japanese academics such as Prof. Yoshihiko Hayashi (1992) proposed a formula based on calculating the proportions of Kanji characters, hiragana, katakana, romaji and other symbols in a text as a proxy for readability. More recent work by Satoshi Sato, Suguru Matsuyoshi, Yohsuke Kondoh (2008) Nagoya University tackles the issue from a more novel angle. In their research they compiled a Textbook Corpus of 1,478 sample passages of Japanese text extracted from 127 textbooks of elementary school, junior high school, high school, and university. From this data they were able to calculate the probability of any given kanji character appearing at a given educational reading level i.e. rarely used character symbols are unlikely to appear in lower class level materials. Later expansion of their work by Sato (2014) expanded this work from single kanji character (unigram) model to two character (bigram) model with improved accuracy in predictive results. 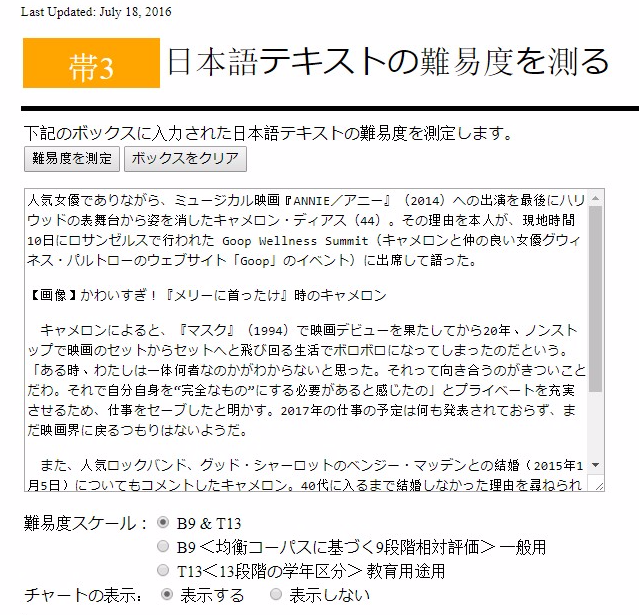 The outcome of Sato’s work is this brilliant online tool that can be used to test the Japanese Readability Score of any article or post. You’ll need to copy paste the text into the box and click the button on the top left for the results (top right clears the box). Readability is an important topic for content creators. Although there are not many tools available for checking readability of Japanese language text, the Satoshi Sato Nagoya University tool helps fills the gap.